September seemed to FLY by. It started with Mr. J working super hard all Labor Day weekend. I had a lot of time with the little one. He was so good but I give single parents soooo much credit. I also was trying to fit in a bunch of blogging and vacay prep – some happened, some didn’t. It was a busy time to get vacation details planned, get the grandparents ready for babysitting and dog-sitting, and to get physically ready for a lot of hiking. Speaking of vacation – it was ahhhhmazing! I didn’t cook a ton this month, but I was pretty happy with a bunch of what I cooked! 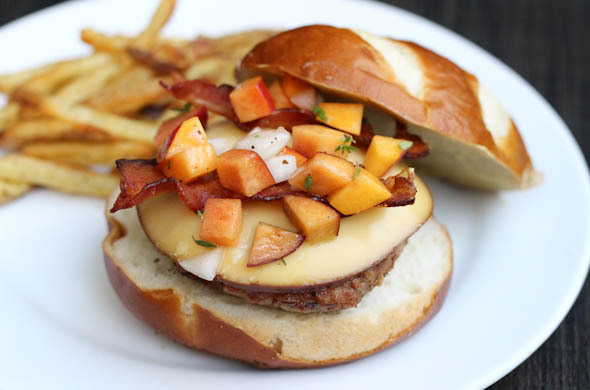 This burger wins for best in show: Smoked gouda, bacon, and a peach relish. 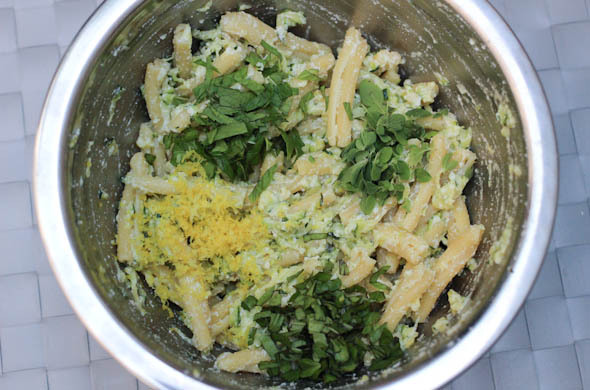 I loved this pasta my boss made with ricotta, zucchini, mint, and lemon zest. It felt summery but I love ricotta so much that I’d keep making it until the mint in our garden is no-more. Which means I probably have another month or so. I brought Greek Deviled Eggs to the potluck at work and they were a hit! I packed them up in my egg carrier and added the cuke/feta/tomato toppings just before serving. My photo-op one here is plated, but I sprinkled the feta all over the tops of them and it was way easier (and cute!) instead of placing each piece. 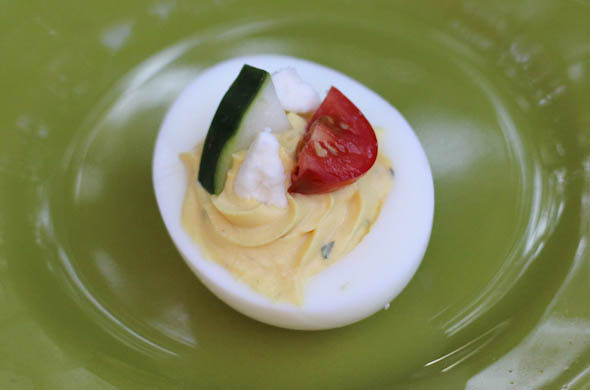 I have a few more deviled egg ideas. Stay tuned! 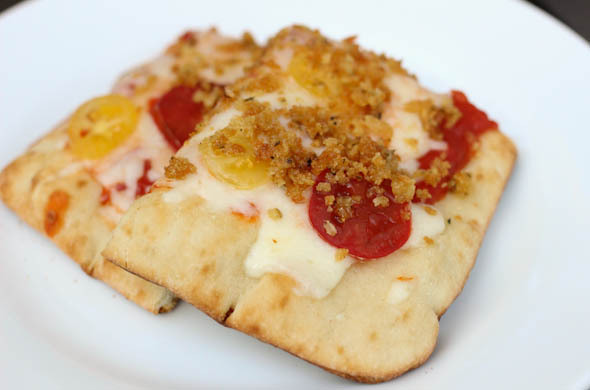 My last fav of the month was an heirloom tomato flatbread with truffle breadcrumb topping. What’s not to love? It was ~5 ingredient dinner and ready in 10 minutes (plus grill preheating time). Vacay was so incredible. It was the longest I’ve been away from the little one but I think it is good for all of us. Mr. J and I made the most of every minute and were just astounded by the Utah/Arizona area. We flew to Vegas and had a quick night there with a tour at the Neon Museum and a great dinner. Then we went through Valley of Fire and absolutely loved it. It was so red and had such huge rocks with far visibility. That was actually one of our toughest hikes but was one of our fav spots. 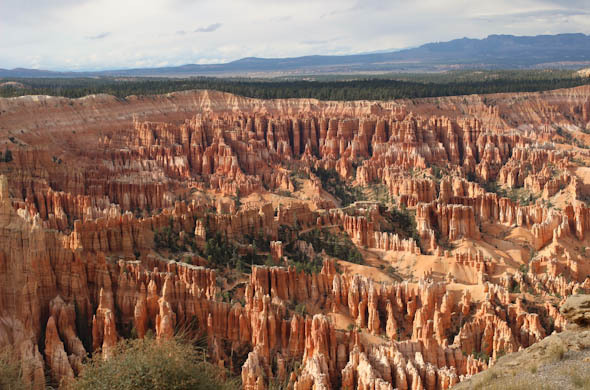 Then we went to our airbnb and spent 2 days in Zion, 1 day in Bryce Canyon, and 1 day to canyons & coral sands. It was breathtaking and we loved hiking and photographing it all. We clocked about 12,000-20,000 steps per day and were wiped at night. It was just incredible and a different vacation for us. Next up, my new job! I have just a few days in-between but after a year of job hunting, I’m off to a new adventure in higher ed doing alumni/annual giving. I’m very excited but it’ll be bittersweet to leave. I’ve absolutely loved and been so proud to be part of my last organization so it was hard to break the news and took finding the right fit to even get me to the decision. Job transitions are so tough and emotionally charged. The waiting and interviewing and offers feels like a lot. I’m grateful for this new opportunity. I’ll have to pack lunch now! Stay tuned! He had such a fun stay while we were away. He was lucky to get to see all his grandparents that week! The highlight of his month might have been a weekend to Maine to see the big boys play football. He loves them dearly and they are so nice to him. The little one is obsessed with a nerf football and runs around yelling “tumble!”. He is excited each day to “play with the big kids” in the preschool class at daycare. I love hearing how well he’s listening and doing there – they said he doesn’t want to walk downstairs because he thinks he’d go back to the toddler group. His sentences are getting longer and he cracks us up. I melt when he says “Mommy and me have blue eyes?” A recent and frequent phrase is “what happened” for everything, multiple times. I’m sad for the early darkness in terms of cooking, he’s sad for early darkness for playing outside. He is still pb&j obsessed on the weekends. He loves the stool up to the counter to “cook” with me, and I love having him there. Year of the seasonal decor: Yes! I grabbed this cute pear and a printable. I have plenty of pumpkins & halloween so I’m not sure what Oct will bring. do more dinner prep more in advance: Sort of…I made a bunch of quick dinners and did some weekend meal prep. read more (and always carry my book on me): I read Women of the Silk and loved it, yet was horrified by the families choosing to send a daughter to the silk factories. Then I read Break in Case of Emergency. It was kind of dumb, but entertaining. watch more movies: hmmm. I don’t think we watched any. focus on clothes that I really like: I fell for a crazy deal. 2 work tops for $7 each…one’s a winner, one isn’t. I need to get on new work clothes though! This is, hands down, my biggest kitchen-win in awhile! We LOVED this burger. The smoked gouda was such an outstanding flavor and the peach added the right sweetness. 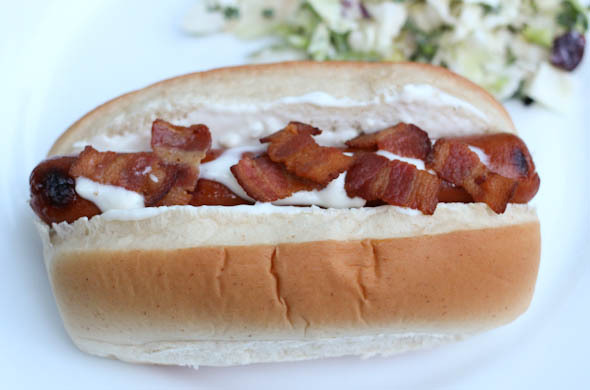 The pretzel bun was just the icing on the cake! Preheat the grill (or grill pan) for burgers and form the meat into patties. Cut the bacon in half and pan fry until crisp then drain. Dice the peach and onion pretty small, and mix with the oil, vinegar, thyme, and a sprinkle of salt & pepper. 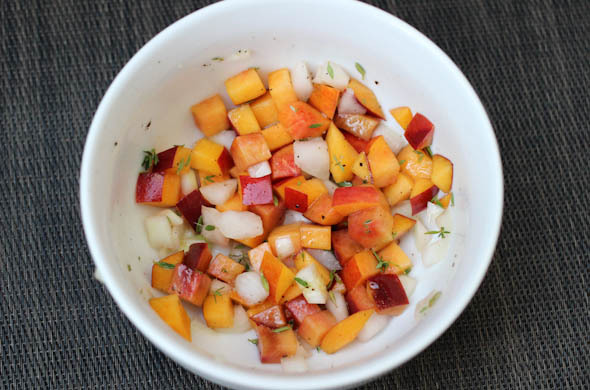 Shoot for a 2:1 ratio of peach to onion. Refrigerate until serving, while the burgers cook. Grill the burgers until desired internal temperature. Mine was pork, Mr. J’s was beef. Top with the gouda and give ~2 minutes for it to melt – it needs longer than some other cheeses. Slice the buns and cut off some of the bun if it is too big for the burgers. Spread some dijon mustard onto the buns, put the burger and melted gouda on, then top with bacon, then lastly with the peach relish. This was suchhh a fantastic combo. I’m peach/nectarine obsessed during the last of the fresh peaches this year. The smoked gouda had a really dominant and outstanding flavor. It makes me want to use it for burgers again! I thought about grilling peach slices but thought this would be easier to eat. The little one ate the same thing but I just put the peach relish on the side. We cut out some of his pretzel bun too for ease of dicing and him eating. 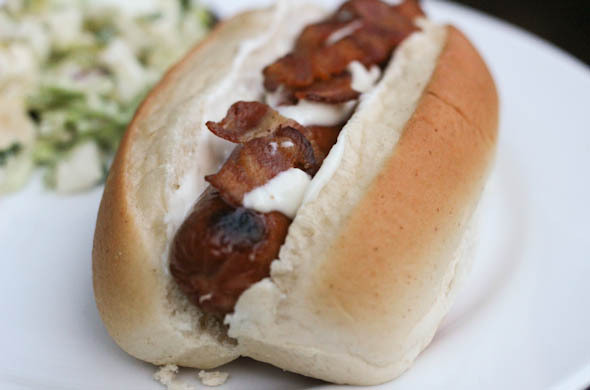 This quick relish would be really good on a pork tenderloin, or a grilled portobello, or on a white fish- maybe tilapia. I’m in this weird limbo where I want to make chili and eat all the pumpkin things but also really want to hold onto summer foods! The produce is just so good! The colors are spectacular! Serve all my meals outside!! 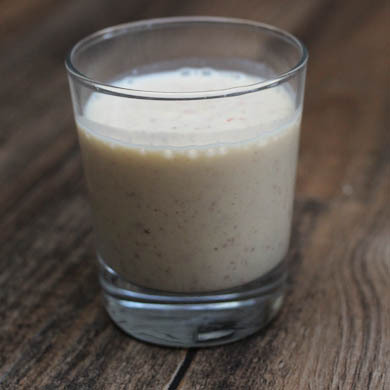 This smoothie made me think summer, buuuut would also work well in the off-season with frozen peaches. Gasp! I know. It isn’t the time of year to buy anything besides fresh/local. They’re one of the best frozen fruits and I’ll be honest, my peaches came from the grocery store for this one. After a weekend away in Maine I was doing a late night grocery shop and wanted all the fresh things! I added yogurt for the cream factor, as well as protein. 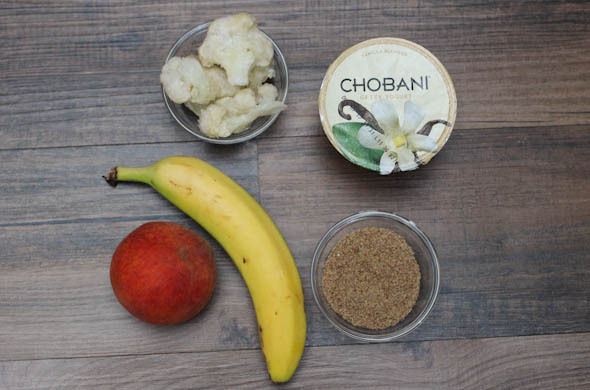 The banana and cauliflower are both mild but add some fiber without overpowering the peaches. The ground flax seed is mostly tasteless but adds omega-3s for heart health. Registered Dietitians at work said they must be ground…otherwise you won’t process ‘em, you’ll just host them until they depart. I pop them into the coffee grinder. 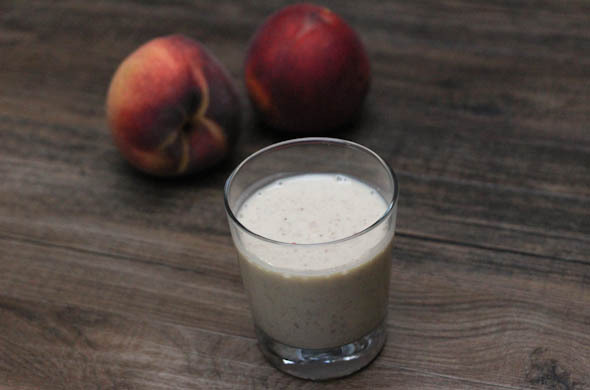 Chop the peach, banana, and add everything into a blender. Frozen peaches might actually be even better. I KNOW! Don’t say such things. I like smoothies to be cold, frosty, and I’m not sure I’d taste the difference of a frozen peach and a fresh one here. I might have fallen deeper in love if it were colder. I only had 1 small ingredient frozen: cauliflower, then I added some ice. My boss made this for a potluck and it was delicious. I knew I had to whip it up immediately. I liked it warm-ish and it’s great cool. 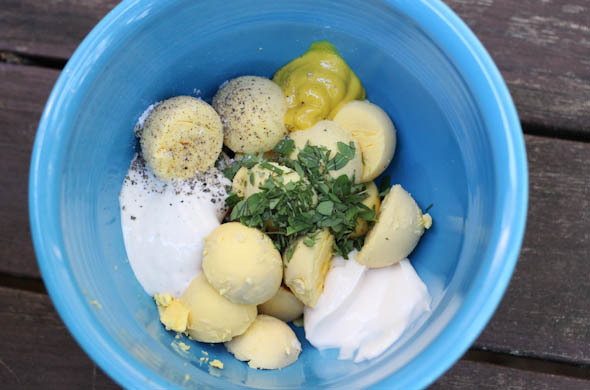 I could live in a container of ricotta, but I also LOVED the mint, basil, and oregano with the lemon zest. 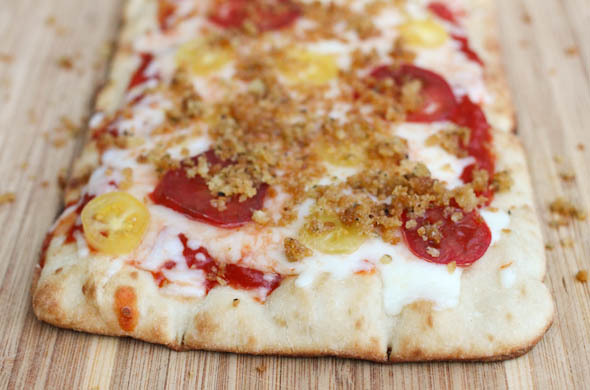 It is so easy and so so so full of flavor! Also this is the world’s fastest dinner. 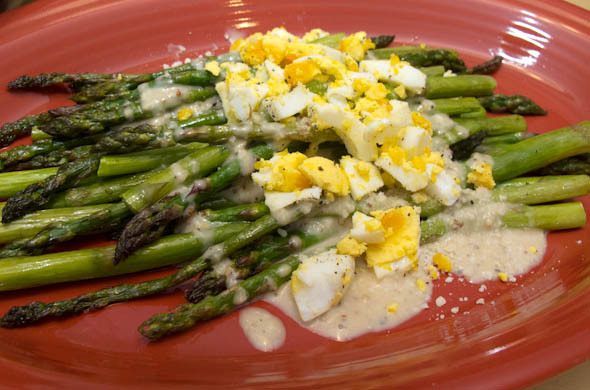 Martha made a similar one, though hers uses sliced zucchini & fettuccine. Food & Wine made a similar one, with zucchini chunks. Epicurious made a similar one, with fewer herbs. Bring salted water to a boil and cook the pasta until al dante. 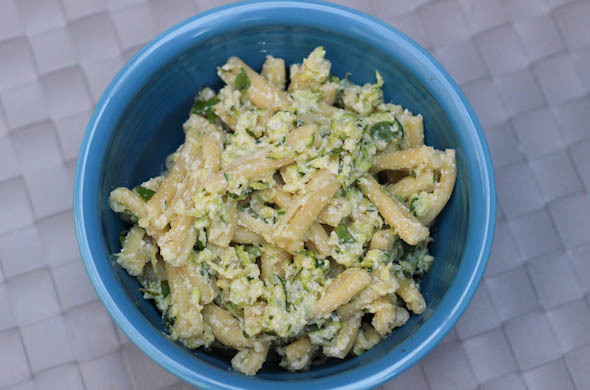 While the pasta cooks, shred the zucchini and add to a medium skillet with the garlic and cook for 2 minutes. Add salt & pepper and remove from heat. 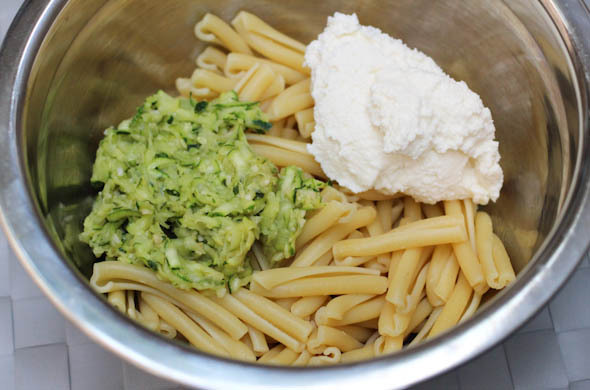 Mix the pasta, ricotta, and zucchini mixture. Add in the herbs, lemon zest, and salt & pepper. Serve & enjoy, or refrigerate until serving if making in advance! I like the creamy ricotta. Of course, ricotta is my fav! 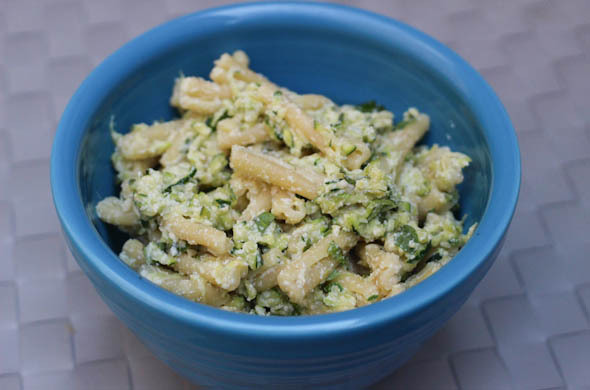 Zucchini doesn’t have tons of flavor alone, but with the garlic and all the herbs. I think it needed salt and pepper throughout: in the zucchini and mixed throughout. 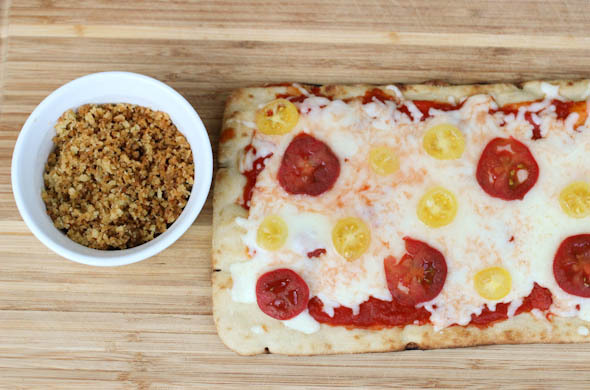 The herbs and the lemon are truly what make this special. 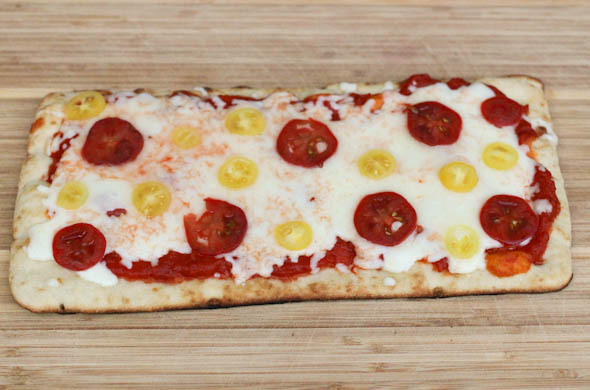 Maybe I should turn the same flavors into a pizza! I’d pick a rodeo burger that calls for a par-tay! 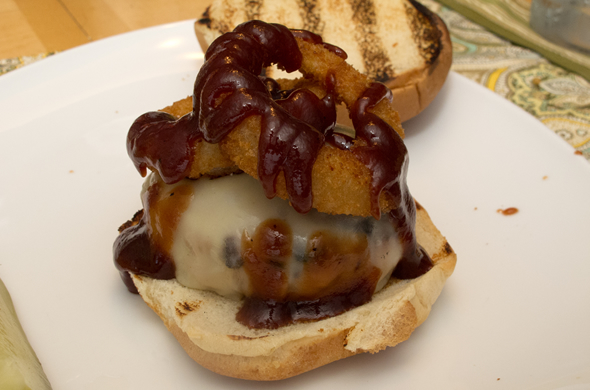 Rodeo burgers are topped with melty cheddar, BBQ rub, onion rings and a drizzle of BBQ sauce. 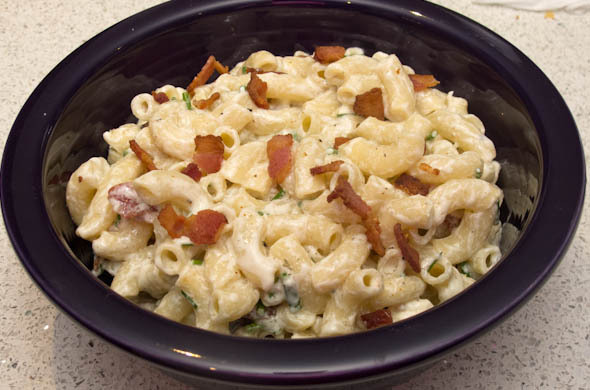 Why not add some Bacon & Blue Cheese Pasta Salad that is ideally made in advance. 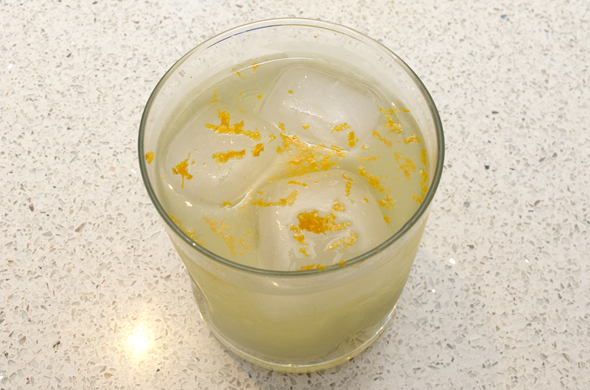 and a Creamsicle Cocktail to wash it down with orange soda, whipped cream flavor vodka, and orange zest.